Our itinerary together begins on San Cristóbal Island and Puerto Baquerizo Moreno, the capital of the Galápagos Province. On our first afternoon, we visit Cerro Colorado, breeding centre of the islands' famous giant tortoises amid a fantastic deciduous forest. We sail north overnight, to awake at the sunken caldera of Genovesa Island, a privileged place to visit amid thousands of marine birds. Back in the central islands, on Thursday we learn about Buccaneer Cove's distant and recent history aboard our pangas, before exploring the underwater realm, snorkeling or aboard the glass-bottom boat. Across the way, we disembark at the popular site of Puerto Egas, a great place to see land and marine birds amid a landscape of tuff-stone layers and lava flows. Motoring all night, we find ourselves in the youngest islands of the Galápagos the next day, visiting Punta Espinoza with its amazing combination of barrenness and abundant wildlife. Highlights include hawks, penguins and the flightless cormorant. Later, at Tagus Cove, an uphill hike takes us to the rim of Darwin Crater and some lovely views, following by a panga ride to spot local wildlife, a swim, kayak or snorkel. We continue our exploration of Isabela Island the following day, at Urbina Bay, the intriguing result of an uplifting of the ocean, home to large and very colourful Galápagos land iguanas, and then at Punta Vicente Roca with its abundant wildlife and, hopefully, sightings of green sea turtles. Sunday sees us anchor to visit the red beach of Rábida Island and its large colony of sea lions, marine iguanas, mockingbirds, yellow warblers and several species of Darwin's finches. In the afternoon, we visit the north shore of Santa Cruz, host to Cerro Dragon (Dragon Hill), home to land iguanas and with a trail that offers a beautiful view of the bay. We land at Puerto Baquerizo Moreno's airport and transfer to the dock and the Isabela II, where we check in, receive an introductory briefing and have lunch on board. After lunch, we land back at Puerto Baquerizo Moreno and drive 40 minutes to the island's southern shore. At Cerro Colorado, we visit the breeding centre of the highly-endangered giant tortoises in the midst of a fantastic deciduous forest, home to dozens of bird species and the endemic San Cristóbal lava lizard. Overnight, we navigate northbound to the incredible bird island, Genovesa, crossing the equator on the way. The morning starts with a panga ride along the cliffs of this dramatic island, followed by landing with a steep climb (90 feet) up some stairs to reach a flat plateau. Along our walk, we can observe large colonies of Nazca boobies, red footed boobies, great frigate birds and storm petrels. Those not wishing to disembark can enjoy a longer panga ride along the cliffs (depending on weather conditions). We can also enjoy snorkelling and kayaking. In the afternoon, we land at the beach for an easy stroll observing hundreds of birds, mainly frigate birds, red footed and Nazca boobies, gulls, herons, finches and mockingbirds. There's an optional walk over sharp lava and uneven terrain for dramatic views, or else we can return to the beach to enjoy snorkelling at this beautiful natural harbour. After breakfast, we enjoy a coastal exploration along the impressive cliffs of Buccaneer's Cove, learning about the area's distant and recent history. The cove is home to a large number of marine birds, sea lions, and inter-tidal organisms. Enjoy fantastic natural formations such as the "Elephant Rock", "The Bishop" and an impressive natural cave. This is a great site for snorkelling too! Or ride in our glass-bottom boat. This is a great opportunity to see land and marine birds amid a landscape of tuff-stone layers and lava flows. At low tide, marine iguanas graze upon the algae beds and we can also observe a colony of fur-sea lions. Back at the beach where we land, there's very good snorkelling and swimming here. In the morning, we visit the youngest island of the archipelago, Fernandina. Punta Espinoza has an amazing combination of barrenness and abundant wildlife. Highlights include hawks, penguins and the flightless cormorant. Opportunity to snorkel. Across the narrow Bolívar Channel, we anchor at this cove on the northwest of Isabela. It provided a favourite anchorage for pirates and whalers over the centuries. An uphill hike takes guests to the rim of Darwin Crater, filled with salt water and to a dramatic viewpoint. After our walk, we take a panga ride to spot local wildlife, with the possibility of swimming, kayaking or snorkelling. After breakfast we disembark at Urbina Bay, the result of an uplifting of the ocean in 1954. Here you can find corals, shells and many other calcareous organisms exposed above water. This area is also home to large and very colourful Galápagos land iguanas, and occasionally to giant tortoises. Along the shoreline, after the hike, guests may encounter flightless cormorants and see penguins while snorkelling. Since there is no landing site at this location, the coastal exploration is by dinghy, while the naturalist guide explains the dramatic geology of the area, with remains of lava flows and tuff stone layers. There is abundant wildlife and, depending on the conditions of the ocean, we'll be able to snorkel along the cliffs, hopefully in the company of green sea turtles. Expedition plan for Sunday and dinner. 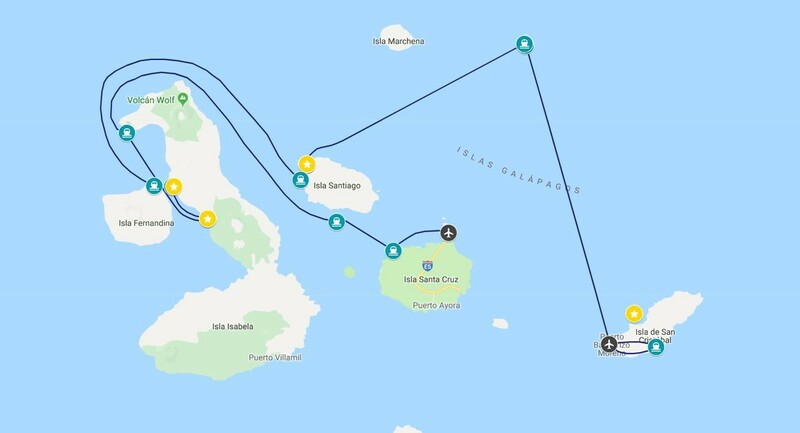 Our itinerary together begins on San Cristóbal Island and Puerto Baquerizo Moreno, the capital of the Galápagos Province. On our first afternoon, we visit Cerro Colorado, breeding centre of the ......click here to read more.